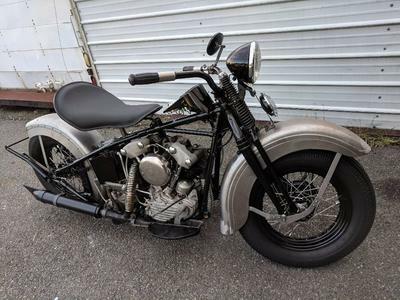 The 1947 Harley Davidson FL Knucklehead motorcycle for sale has been owned by the same family for decades and features the original parts that came on it right out of the factory! The old Harley has the original motor and the original transmission that was re-built less than 100 miles ago. It has the original gas tanks, the original oil tank, and the original (re-built) speedometer as well as the original carburetor and air cleaner; all original! There are some restoration quality reproduction parts, motorcycle frame and front end as well as everything else shown. This nice, old 1947 Harley motorcycle is in Oregon. The original chain primary drive and a new belt primary drive will be included in the sale. 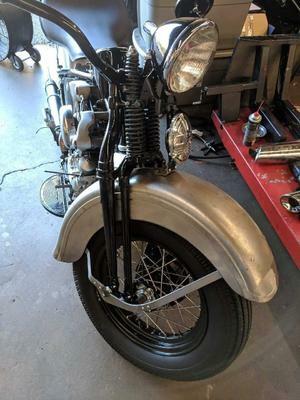 Contact me regarding the '47 HD FL via the comments form below this classified ad provided for your convenience by GoGoCycles Used Motorcycles for Sale. Asking price, and is it titled.